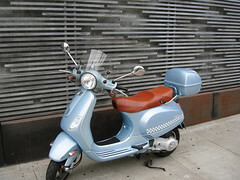 Modern Vespa : FAQ: How do I upload a photo? FAQ: How do I upload a photo? There are two methods for displaying images in a post on the forum: attaching an image to your post and using an image located elsewhere on the Net. Before placing an image on the forum, check the dimensions, resolution and file size to be sure the image is forum-friendly. See the article FAQ: How do I resize a photo?. This method will allow you to upload an image from your computer and attach it to your post. Before attaching, be sure the image meets the forum file size and type restrictions. To attach the image to your post, use the "Add an Attachment" section under the message entry window. Click "Choose File," locate the file on your hard drive and select it, enter and comments (this will display as a caption), then click the "Add Attachment" button to the right. The image will not be visible if you preview your post, but it will display beneath the post text when you submit it. 1. It keeps the image on MV's servers as long as MV lasts, and is not subject to other sites disappearing or expiring. 2. As of 2012-07-24 it ensures the image is served to the reader from a server near to their location, significantly cutting down on download time. 3. When a post containing one or more images is quoted, the image (or series of images) isn't automatically quoted as well. 4. The images are automatically centred, which helps readability. If the image you want to post is in use on another site or a photo hosting service such as Flickr or Photobucket, you'll need to save the image locally and use the method above - or obtain the image address (URL). To get the URL, right-click (Win) or ctrl-click (Mac) and scroll to "Copy Image Address" or "Copy Image Location." Image URLs must end with an acceptable image file extension: .gif, .jpg, .png. When posting an image hosted on Flickr or other services, the URL will sometimes end in "?v=0" or something similar. To post the image, just remove that bit from the URL so the name ends in ".jpg"
The easiest way to do this is to paste the URL, select it, then click the Img button above the message entry window. Note: Some sites do not allow linking to images they host and may display a replacement image in its place. 1. The hosting site may disappear or expire the image, which in the case (say) of a tutorial could render the post useless. 2. The images can (and usually do) take a long time to load. 3. The images are left-justified, often obscuring other parts of the post if the images are large or the reader's screen is embarrassed for space. 4. If a post containing such images is quoted, the whole series of images is quoted as well - rarely appreciated by the reader. FAQ: How do I resize a photo?